I'm specifically trying to get "Option 1" working but failing miserably. I only have two differences in my setup: 1) I'm a Nikon user and 2) I have a YN622N-TX as opposed to the YN622N. However, at least at this point I don't have any reason to believe that the YN622N-TX is unable to fire send out a pre-sync signal over the sync-wire like the YN622C can. Nevertheless I can't get the the YN622-TX to recognize the fact that the camera(Nikon D700) is going above 250 into FPS territory unless I enable TTL passthrough on the V6 that it is sitting on. However, when I do that the RF60 flash that I intend to fire via radio signal from the V6 does nothing...never fires. My question is what settings do I need to make on each component(V6, RF60, YN622-TX) to get this to work? I really love the Cactus product for the remote manual control but I did in fact buy it with the intention of using it like Brian has for occasional sunny day use. I need to be able to "gang-up" multiple RF60s and utilize some form of HSS. So you connected the YN622-TX and the V6 with a cable? Does the YN622-TX manage to trigger the V6 at any shutter speed (even below sync-speed)? I'd test the cable connection by only mounting the YN622-TX on the camera but connecting it to the V6 via the cable. If the V6's green confirmation light comes on when you press the shutter release button on the camera then the YN622-TX is working as intended and you should be able to use RF60s in HSS mode off-camera. 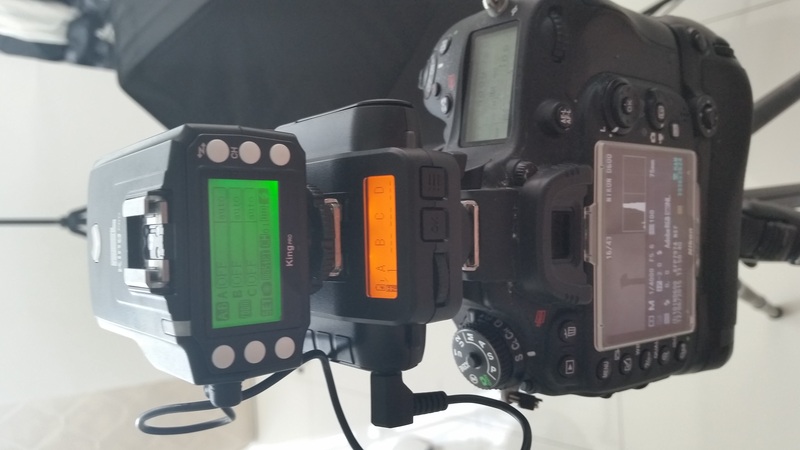 If the above works and you want a more portable setup, mounting the YN622-TX on the V6 and the latter (in TTL pass-through mode) on the camera should work. You may have to select a Nikon flash profile on the V6, though, in order to make sure that all TTL signals are passed-through correctly. Just wanted to share what I just tested with my Nikon D600 using option 1 of Brian Hursey's method (thanks Brian) using V6, Pixel KingPro for Nikon and RF60, the results are that I was able to get clean image no lines at 1/4000 of a second. I only used 1 RF60 so the image is dark but it worked. Here is a picture of the setup atteched. I am trying to get Brian Hursey's option 1 to work. I am shooting with an Olympus OM-D E-M1 with 4 RF60's and a V6 on camera with the YN622C on top of that connected with a PC sync cable. I have enabled TTL passthrough on the V6. Of course, I am able to shoot at 1/320, but as soon as I go above that I get the black bar on the top. So I tried setting the delay value on my RF60's to the suggested 65-75ms, but the image is just dark. Even when I set the delay to 2ms, the image is dark. Would somebody be able to tell me what I am doing wrong? Ultimately, I am trying to shoot portraits outside in the sun so this method would be very useful to me. Hi @vinneydawson , sorry but you are using an Olympus camera so I don't think it would work by using a YN622C which is meant for the Canon system? Others can chime in but I don't think the trigger could trick the camera this way for HSS. Thanks for clearing that up. Is there any solution to achieve HSS with the Olympus? There might be another way for Olympus (e.g., using optical triggering using the pre-flash of a system-dedicated flash) but this HyperSync / HSS approach with the V6 works with any system and does not need a system-dedicated flash.